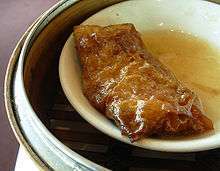 Tofu skin is commonly sold as dried leaves or sheets. Tofu skin, yuba, bean curd skin, bean curd sheet, or bean curd robes, is a food product made from soybeans. 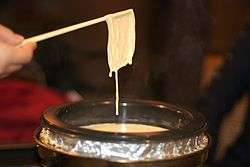 During the boiling of soy milk, in an open shallow pan, a film or skin forms on the liquid surface. The films are collected and dried into yellowish sheets known as tofu skin. Since tofu skin is not produced using a coagulant, it is not technically a proper tofu; however, it does have similar texture and flavour to some tofu products. Tofu skin's use was first documented in written records in China and Japan in the sixteenth century. It is widely used, fresh, fermented, or dried, in Chinese and Japanese cuisine. An early written reference to tofu skin appeared in 1587 in Japan in the Matsuya Hisamatsu chakai-ki [Three-generation diary of the Matsuya's family's tea ceremonies]. The writer, Matsuya Hisamasa, states simply that tofu skin is the film that forms atop soymilk. A third known reference to tofu skin appears in 1695 in Japan in the Ben Zhao Shi Jian (Wade–Giles: Pen Chao Shih Chien [A Mirror of Food in This Dynasty, 12 volumes]. This book was written by Hitomi Hitsudai in Japan, in Chinese. When Japanese read the Chinese characters for tofu skin, doufu-lao, they pronounce them tōfu no uba. Lao or uba means "old woman" or "wet nurse". Tofu skin may be purchased in fresh or dried form. In the latter case, the tofu skin is rehydrated in water before use. It is often used to wrap dim sum. Because of its slightly rubbery texture, tofu skin is also manufactured in bunched, folded and wrapped forms that are used as meat substitutes in vegetarian cuisine. Tofu skins can be wrapped and then folded against itself to make dòu baō (Chinese: 豆包, literally "tofu package"). These are often fried to give it a firmer skin before being cooked further. These are the three basic forms. Each comes in many varieties. Yuba may also be dried and sold as dried yuba sticks (Chinese: 腐竹; pinyin: fǔ zhú, lit. tofu bamboo). By layering or bunching fresh yuba or rehydrated yuba, then tying it tightly in cloth and stewing it, the dried yuba sticks will retain their original shape. This bunched tofu skin is then called tofu chicken (Chinese: 豆雞; pinyin: dòu jī; or Chinese: 素雞; pinyin: sù jī). In Thai cooking it is referred to as fawng dtâo-hûu (Thai: ฟองเต้าหู้, lit. foam tofu). By layering and bunching the sheets in a certain manner, an imitation of chicken breast can be created with yuba. The effect is completed by frying the "skin" side of the tofu chicken until it is crispy. If stuffed with vegetables, it becomes tofu duck. Likewise various other meat alternatives have been made in this way, especially by Buddhist vegetarian restaurants in areas of Chinese culture. The world's first meat analogs were developed in China, probably by Buddhist cooks in temples and monasteries. The earliest process for making these meatless meats consisted of rolling thin sheets of doufupi, literally tofu skin, around a filling of minced, smoked, or other seasoned pieces of tofu skin, tying closed the bundle with string, and steaming until a meaty texture and flavor developed. Other methods include rolling the tofu skin tightly on a chopstick and steaming the tofu skin to form a log. When the log is sliced, each slice will be circular in form with a square hole in the center, which looks like old Chinese coins. ↑ BEAN SKIN (腐竹) ; A PRODUCT OF BLOOD & SWEAT FROM THE MAKERS. Journal of the Hong Kong Branch of the Royal Asiatic Society. 17. 1977. 1 2 Shurtleff, William; Aoyagi, Akiko (2012). History of Yuba - The Film That Forms atop Heated Soymilk (1587-2012). Lafayette, California: Soyinfo Center. 1 2 Shurtleff, William; Aoyagi, Akiko (1983). The Book of Tofu. Berkeley, California: Ten Speed Press. 1 2 Shurtleff, William. 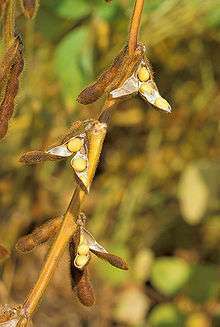 "History of Soybeans and Soyfoods: 1100 B.C. to the 1980s (unpublished)". Unpublished. Retrieved 2013-01-22. 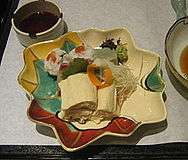 Wikimedia Commons has media related to Tofu skin.